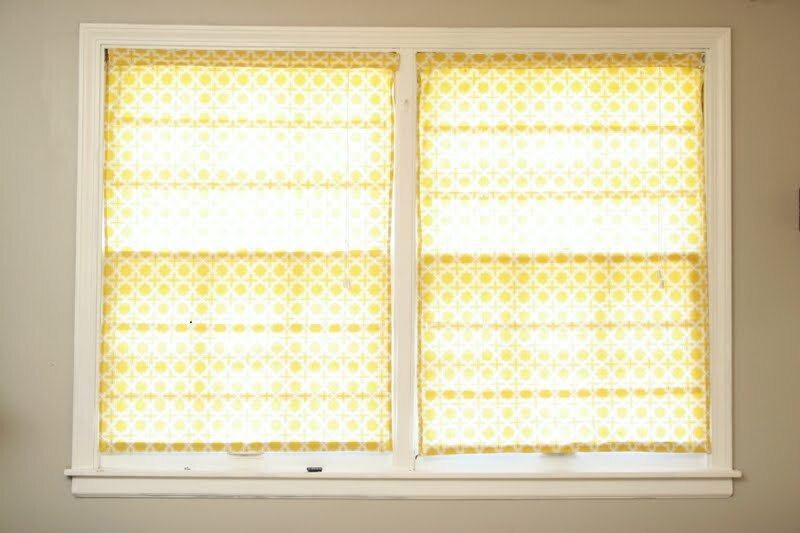 I have finally made some DIY window treatments for our bedroom. I decided on some roman shades. All the tutorials I found were “no sew” which required gluing the fabric. I prefer sewing to make things look a little more professional, so I cut my fabric to size and turned under the edges twice, then edge stitched all around. I ended up with a large panel of fabric. 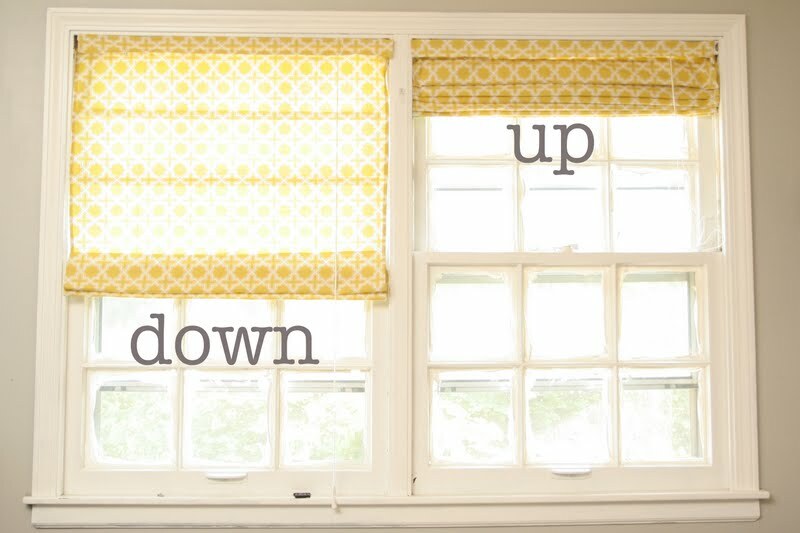 Now you need to take apart your mini blinds. Open it up and fully extend it. Clip all of the “ladder” like strings that hold the slats together. Do NOT clip the larger inner string that goes through the center. 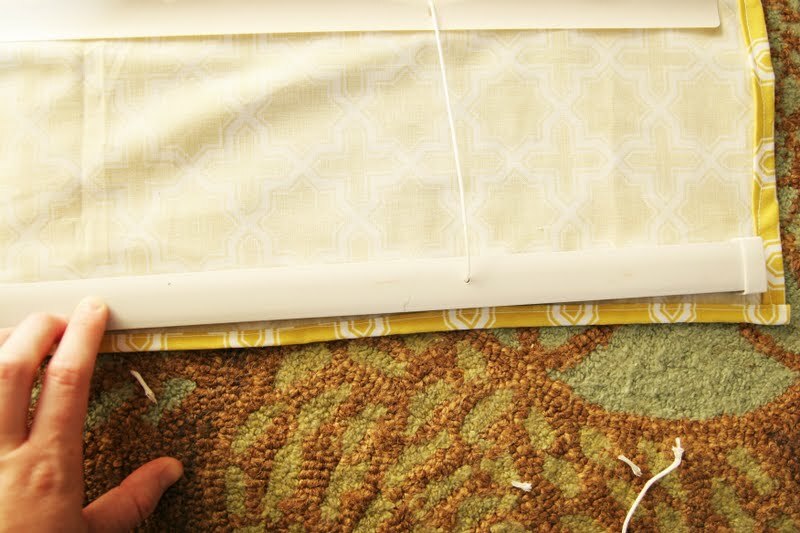 Next, you want to measure out where you want the slats to go on your roman shade…aka how many folds you want. 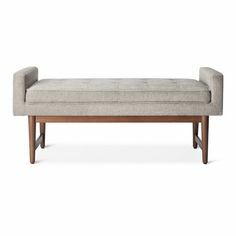 My fabric was 42 inches long, so I just made a slat every 7 inches. Using a ruler, draw lines on the back of the fabric with a pencil. Now you are going to glue the slats on the lines you made. Using fabric glue on the convex side of the slat, smear it on. I tried to smear the glue a little so that when it dried, it wouldn’t look like a distinct hardened line of glue from the outside if that makes sense. Glue them all on as straight as possible. 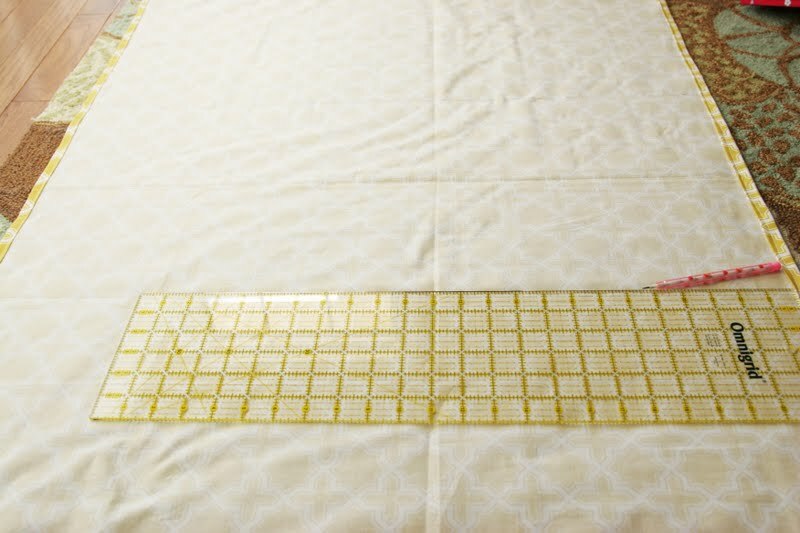 Make sure your fabric is really smoothed out so that there won’t be any wrinkles on the outside. Now place your mini blind skeleton on the fabric, and weave those strings back through the holes in the slats. You may have to pull the fabric away from the glue a bit to get it through, but it shouldn’t make anything fall apart. This is the part I couldn’t figure out. You need to attach the top bar of the mini blind. All of the tutorials I saw attached it like this…but as you will see, the pulley strings (which you need to raise and lower your shades) would be covered up if you did it this way. I don’t know if my blinds are just different or if I was doing something wrong, but I knew this would not work for me. So, instead I flipped the top bar on its side and glued the fabric on the underneath side. (it will make more sense in the next few pictures) For this part, I used hot glue. 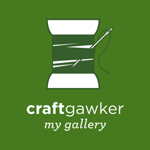 The other tutorials say to use fabric glue because hot glue might disintegrate over time. I felt like fabric glue wasn’t strong enough to hold this heavier piece. So, I guess we will see if my shades hold up. I figure the worst that could happen is it starts to fall off and I just re-glue it. You are not quite done! 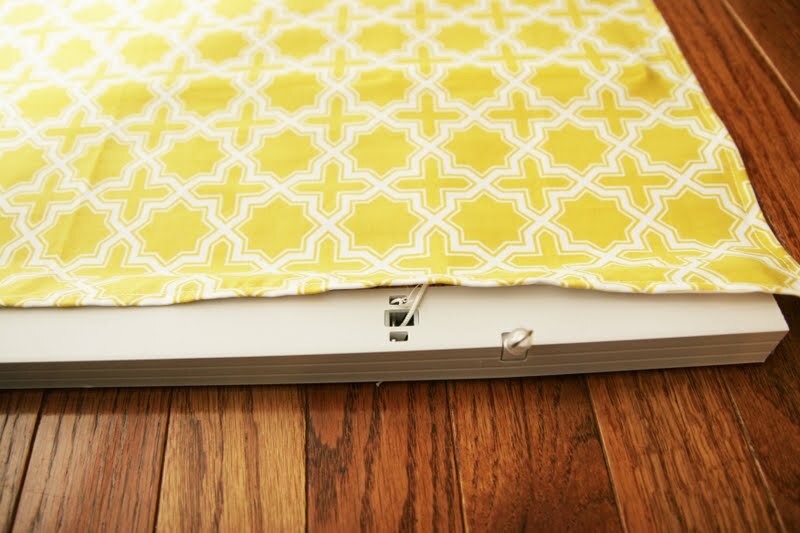 See how I glued the top of the fabric to the top bar? It’s hanging from the under side. The only problem is now that tacky white bar is exposed. Notice my solution? Much better. I just took an extra strip of fabric, turned under and sewed up the ends and hot glued it onto the white bar. It’s not even noticeable now. And you are done!! It’s so easy!! Now, I was prepared to add another layer of room darkening fabric, but I actually think mine are fine the way they are. 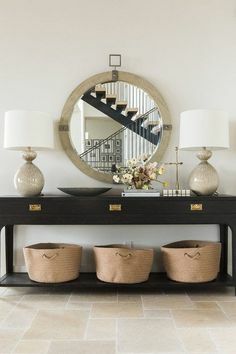 If you like your room super dark, you could add this step. And in case anyone is worried, right after I took these photos, I attached some little thingies to the window panes up at the very top to wrap the strings around to keep them out of reach of the kiddos. I don’t know what the technical terms are, but you know what I’m talking about. I was stressed out about doing this as soon as they were installed for safety reasons! 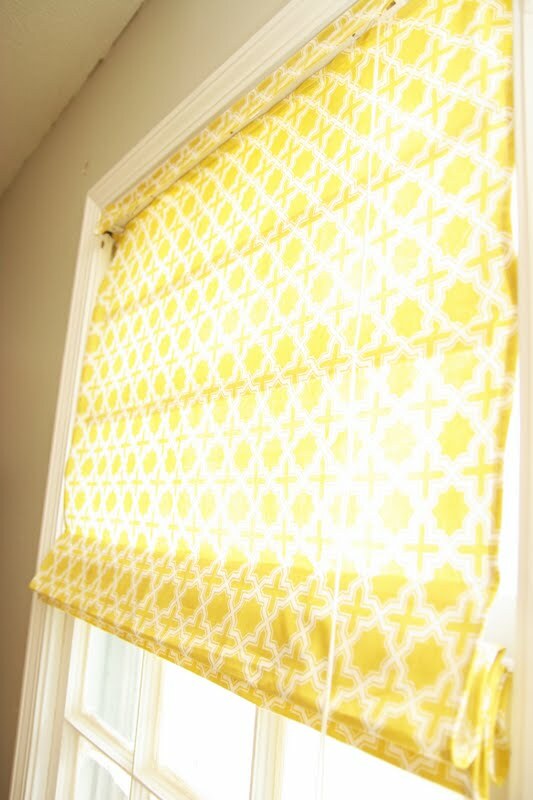 Store bought roman shades start around $35 each…so making them yourself will save you a ton…plus you can totally customize them to be exactly what you want!! LIKE WHAT YOU SEE? 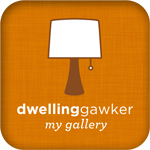 FOLLOW ME ON FACEBOOK AND PINTEREST!! And don’t forget to go check out my current post! That is such a neat idea Megan! I love it! I’ve been trying to figure out how to do this sort of thing. Thank you so much. This looks easy but somewhat time consuming but I’ll be so proud of them. You did a great job explaining. They look great! Your tutorial makes this project look so easy. Great job! I love the fabric you chose! I've made a few of these for my house a while ago, can't wait to make some new ones for my bedroom. I like the idea of sewing instead of gluing which is what I did. What a neat idea! I can't remember, are you going to have drapes on the sides too? You make the best stuff, Meg! These are SO CUTE! And I LOVE Joel Dewberry fabric – gorgeous. I'm bookmarking this for future reference! You're awesome! Its a new and amazing idea!! i am impressed with your stuff. Its just perfect! LOVE this idea. Going to tuck it away for future windows!!! Window Blinds UK has become one of the leading manufacturers of blinds in the UK. I love how you covered the top bar! Thank you for sharing this tutorial! This is so great. I have been staring at two bare windows in my sunroom for years now. 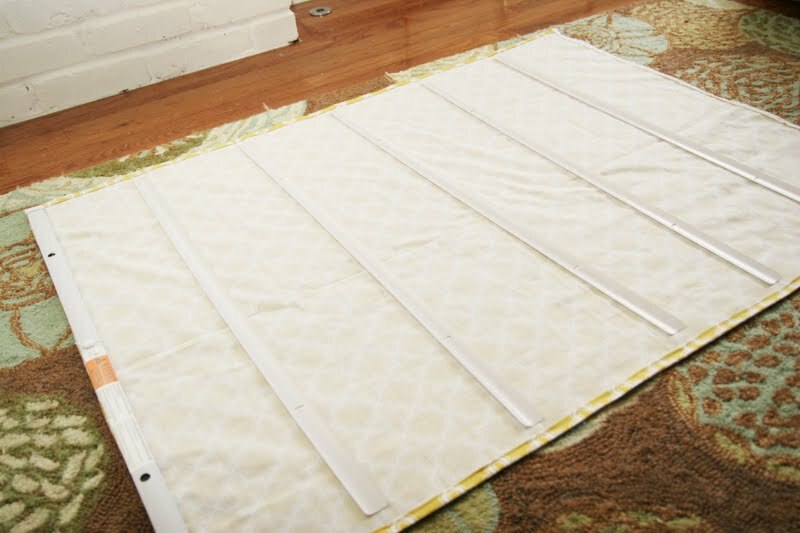 I am going to try my hardest to make these, what kind of white glue did you use for gluing the slats to the fabric? I am so glad I found this but wished it had been a little sooner. I just threw away my awful, dusty old blinds. I so want roman shades so it looks like I need to go buy some cheapos if I cannot get any off freecycle. Thanks for the tut! I used five blind slots and glued them together, this prevented it from ripping. And i used no sew heat tape. Maybe for the next one you make it will help. I've attempted this project too. Thank you for the alternations you made to the original instructions! Now I can go fix mine! 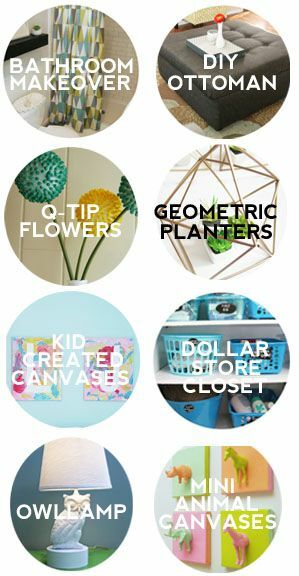 I found this tutorial on Pinterest, and I've seen the other tutes. Yours is the best. 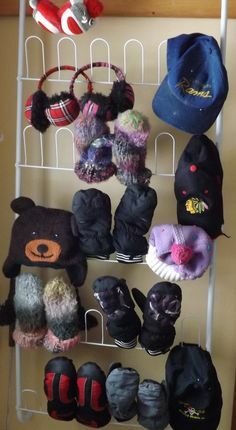 I'm repinning, and I'll try my hand at making a pair. Thanks so much. Love this, I have wanted these for a long time, now I know how to make them!! Great idea!! Great idea! 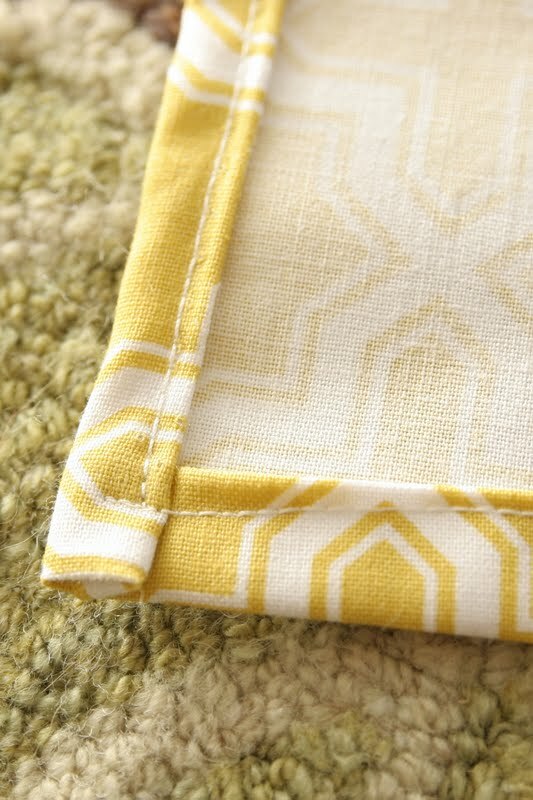 Love the yellow fabric too. 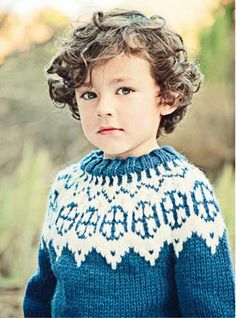 Found you on pinterest. Thanks for explaining the solution to the string in the back! I was stuck on it and your solution was so simple and great! really appreciate it. You would laugh if you heard how many times I said. "OMG I Love it" while reading your tutuorial. Now I wish I hadn't thrown out the blinds for my room, but I still have the blinds for the office and those windows need serious help. I think even my husband can see the beauty of this project. I know I won't be able to do this alone but I'll get help. Thanks for sharing!!! 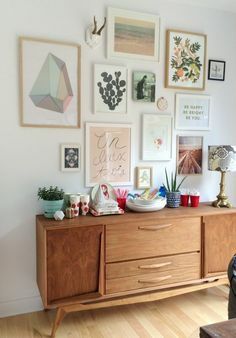 Very interested in this project but definitely want to line the back to create a cleaner look from the exterior of the window as I plan to put these shades in a window that is on the front of our home. Any suggestions on attaching a liner to hide the unsightly blinds? I would greatly appreciate a tutorial on that additional project aspect if possible. From my internet research, I believe lots of others would benefit from such instruction as well. Thank you. 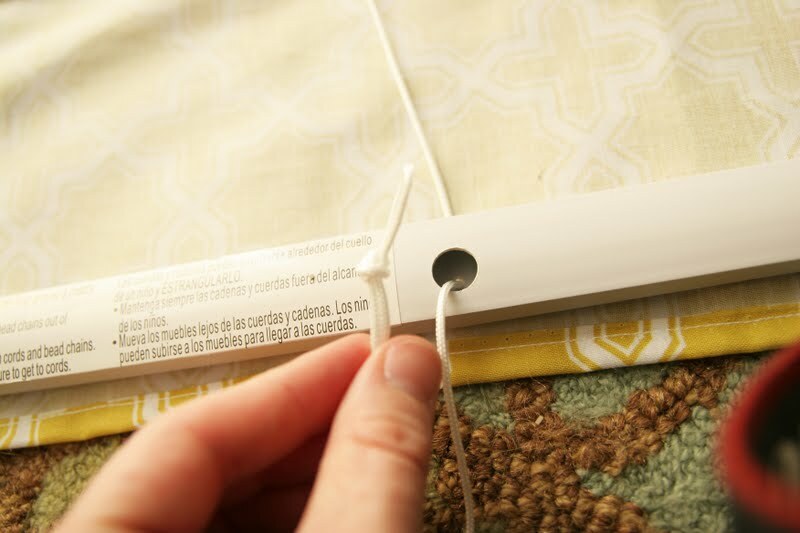 Heather, I am just reading these comments now, so I don't know if you've found a solution…or if you'll even see this message… but you can buy regular-length blinds for $5 and then go buy the white cording at a fabric/craft store and re-string them yourself using the longer cording! It's really easy to string it through! 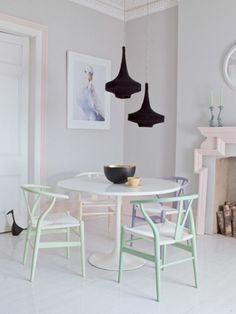 You can leave the blind unlined which is an ideal solution if you have chosen a sheer or a voile fabric allowing a greater amount of light into the room compared to the other options. 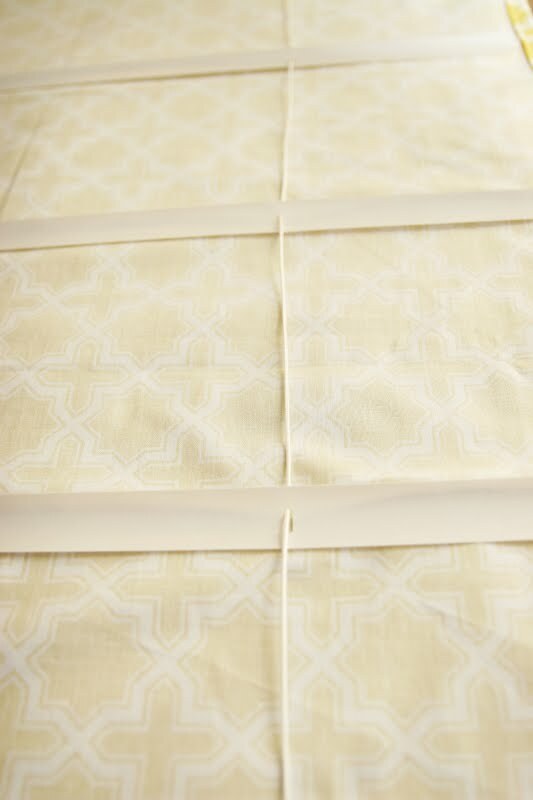 Next are white and cream standard linings that will limit some of the light and provide a level of thermal insulation. 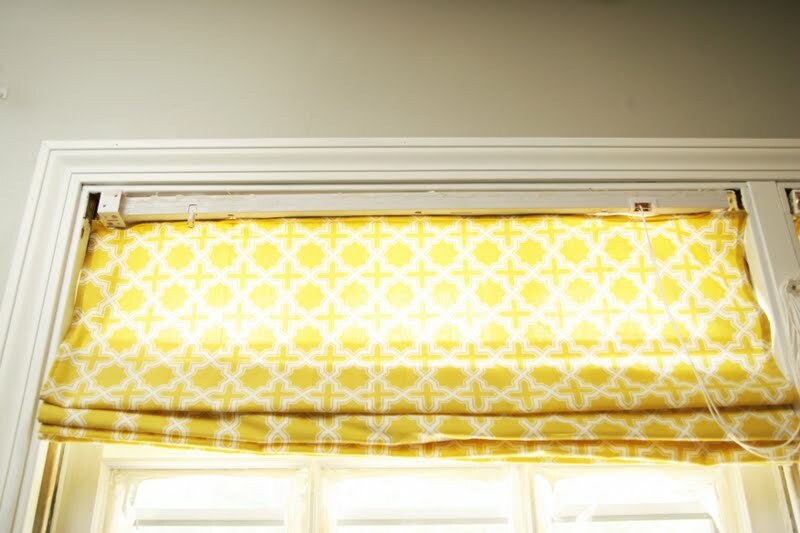 I'm late to this DIY roman shade party! But, I'm hooked and have read many, many tutorials. I just wanted to tell you that your idea for keeping the cord accessible is the best I've seen. I made 2 already before I found your instructions. My blinds are kind of different in the way they are mounted but if I can figure out how to change it around, I'm going to follow your lead. Thank you very much! 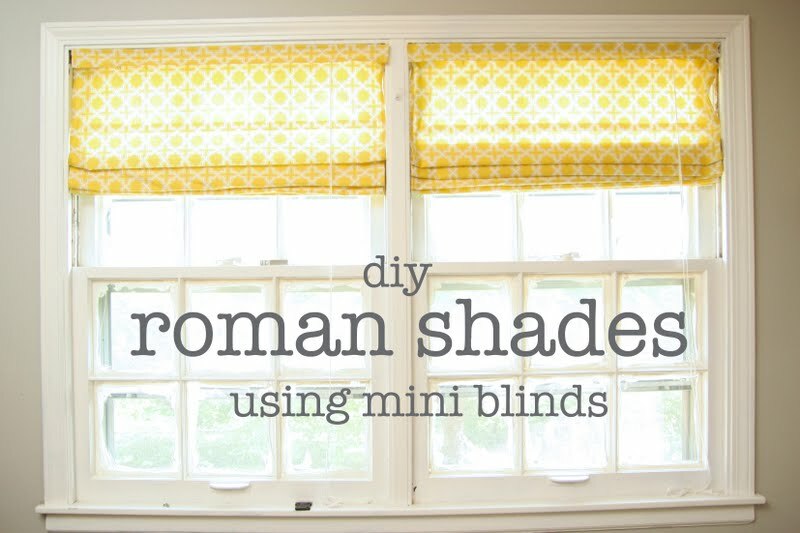 I love Roman Shades, such a fun style and it's so cool to see some great DIY options. I'm always worried in getting the sizing right but you're step by step photos have inspired me. Just found your great tut! I'm going to do this! I've been wanting blackout curtains in my house for a long time. Unfortunately, they are prohibitively expensive. I've seen ideas about sewing panels onto the back of existing curtains but didn't want to do that because you can't wash blackout fabric. I've also seen making flat curtains and hanging behind actual curtains and the amount of fabric that took would be expensive, plus my registers are directly under the windows and, blackout fabric or not, if it is blowing around, its not going to work. I saw this on pinterest and decided to give it a try. I found blackout fabric at Hobby Lobby and was able to get 5y on sale for $20! I started with the guest bedroom because although no one sleeps there but once every few months, the morning sun hits it dead on and it gets really hot in there. I had no problems deconstructing the blinds- your directions were really great! However, I guess because I was using black out fabric and its heavy I could not get hot glue to keep it together. I used gorilla glue instead. It wouldn't work on regular fabric because it stains, but these blinds are going behind curtains anyway, so I didn't really care. 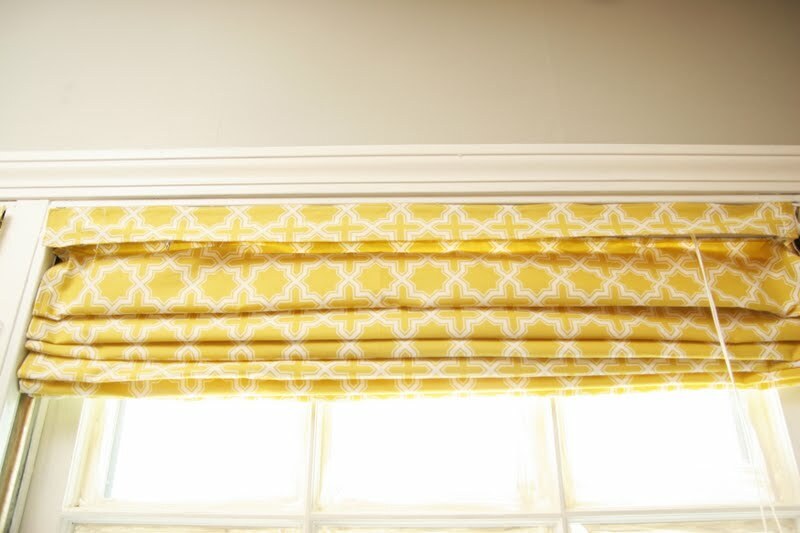 I had trouble securing the fabric to the underside of the top part of the blind though, so I just glued it to the front and used an exact-o knife to cut open a hole for the strings. Sounded like a good idea but now I can't put the little plastic squares back in to hold the rod in place. 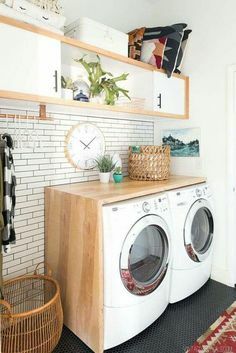 Could you please clarify how and where you attached the fabric to the top of the bar? Such an impressive work you have done here, totally changed the concept of blinds. You've made these look so easy – was it your first attempt at doing them? Get today my best omaha lawyers that is available for you now! Find now a great omaha personal injury attorney currently in the office now! Get Services From the amazing financial planning whitefish that is now available in addition very professional now! Get service from the amazing hotel social media that’s now available in addition at great prices today! Get today the geatest personal injury attorney lawyer currently available for you now! Get service from the fantastic HeartStone Advisor currently currently available and very honest now! See Here the geatest omaha family law free consultation currently present for you now! See Here the geatest omaha car accident lawyer currently present for you now! Get service from the fantastic investment management that is now available in addition very professional now!